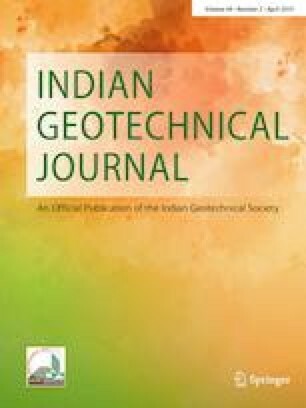 This paper describes the effect of basement excavation and foundation loading on tunnel in sand. Typical tunnel geometry of Delhi Metro and soil conditions in part of Delhi (Yamuna Sand) are considered for modelling. The construction sequences of tunnel excavations, basement footing with retaining wall and the loading on footing have been numerically simulated using plane strain assumption in PLAXIS 2D. Basement foundation, retaining wall, sheet pile and support struts are modelled simulating the construction sequence that is normally adopted in practice. The soil is assumed as elastic-perfectly plastic material, and its failure is governed by Mohr–Coulomb criterion. The tunnel lining, footing, sheet pile, wall and struts are assumed as linear elastic materials. The loading on the footing is modelled in several stages simulating different numbers of storeys for studying the effect of basement excavation and structure/foundation loading. The results indicate that the response of tunnel lining is significantly affected by various stages of basement excavation and foundation loading. Based on the several response parameters of tunnel lining, it is concluded that the critical distance between the tunnel edge and basement footing is found as 2.5 times the tunnel diameter within which the basement excavation and foundation loading have shown significant influence on tunnel response. The authors would like to gratefully acknowledge the financial support received from the Science and Engineering Research Board (SERB), Department of Science and Technology, India (EMR/2015/001874).